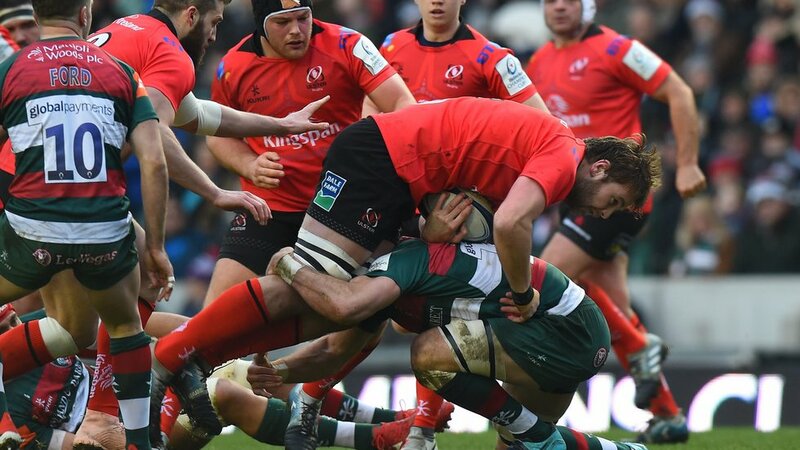 Two tries in a five-minute spell in the second half gave Ulster a 14-13 victory over Leicester Tigers in an enthralling encounter in the Heineken Champions Cup at Welford Road on Saturday. Tigers were unable to qualify for the knockout stages even before kick-off, though their visitors were still chasing the points to make mathematically certain of a place in the last eight and possibly even home advantage there. The hosts were well worth their 10-point lead at half-time, though they had had to be patient for the breakthrough try after an early penalty from George Ford. The score eventually came from Matt Toomua on the stroke of half-time, with Ford adding the touchline conversion. Ford made it 13-0 early in the second period and the game was an hour old before Ulster grabbed their first points with a converted score from Marty Moore. But they quickly added a second through Robert Baloucoune to lead by a point and retained the margin to the final whistle. 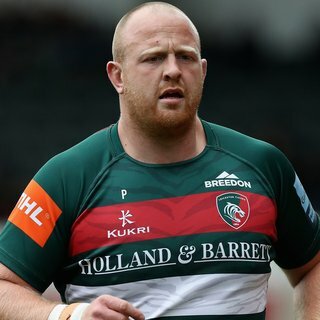 Tigers welcomed back England internationals Dan Cole, George Ford, Manu Tuilagi and Jonny May after sitting out the trip to the Scarlets in Round 5, while Ben Youngs moved to joint-third in the club’s all-time list for European appearances as he ran out for the 68th time in the tournament. Ulster made just one change from the team that beat Racing 92, with Lions lock Iain Henderson returning to make his 100th appearance for the province. The Ulster fans on the terrace were in full voice as French official Alexandre Ruiz, in charge for the first time at Welford Road, got the game under way on a chilly but bright winter’s afternoon, with Ford kicking towards The Robin Hood Stand end. 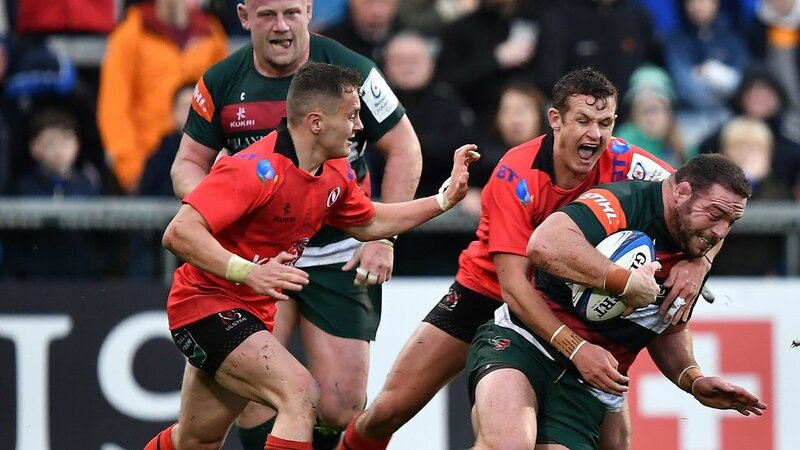 A knock-on by each side punctuated the opening exchanges, but both teams looked keen to attack from deep and Tigers had the best of the early chances as May kicked down the right following superb defensive work from Dan Cole back in his own half. But Jacob Stockdale got back to cover in-goal in a breathless period of play from both sides. Play paused momentarily as Greg Bateman had his head taped up following a scrum near halfway, but the prop was back in the action for a strong drive from the forwards which ended with another error from the visitors just outside their own 22. Tuilagi and Matt Toomua combined in midfield to take play almost within reach of the tryline but Ulster got back to defend and also closed out Olowofela as play spread to the left wing. Youngs sensed an opportunity as he broke from the blindside of a scrum 30 metres out before being bundled into touch on the left. Both teams were also keen to put pressure on their rivals with high kicks in behind defence and from one Ulster centre Stuart McCloskey thought he’d broken through, only to be hauled back for a knock-on. The first quarter passed without either side making a breakthrough but with relentless effort on both sides of the ball. It was Cole who looked like he’d found the right moment, timing his run on to a delayed ball by Ford to perfection on the edge of the 22, only to be stopped by the covering defence, Although Tigers arrived in support, the move ended with a knock-on as play moved to the right. A high tackle on Will Addison from Brendon O’Connor near halfway gave Ulster a chance to push play upfield but they missed their timing in the lineout and Sione Kalamafoni was able to steal possession. A huge hit by Mike Williams on full-back Louis Lutik knocked ball loose near halfway and gave Tigers put-in at another scrum. The half-hour mark approached as Graham Kitchener sold a dummy to the Ulster defence on the left and it looked a promising position for Tigers until their rivals pressured Youngs at the breakdown and forced ball loose. A push from the Tigers pack almost won scrum ball against the head on the Ulster 22, and Youngs reacted quickly to bring down opposite number David Shanahan and Tigers were awarded a penalty at the next breakdown, giving Ford a first sight of goal. He struck it well to put first points on the board with 31 minutes gone. Ford over-cooked a clearing kick moments later, though, and after it had run dead, play came back for an Ulster scrum on the Tigers 10-metre line. McCloskey almost found a gap as Ulster opened up play, only for Ford to take him down and then Youngs brought down Shanahan just 10 metres out. The support was too slow to arrive and Tigers quickly swarmed over the breakdown to snuff out the danger. 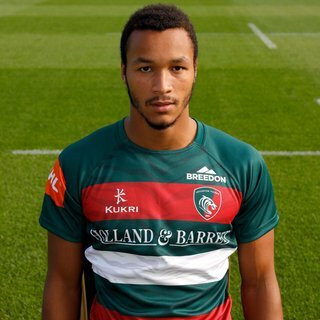 More patient work in attack for Tigers, with Cole and Williams carrying again, finally brought the opening try as Toomua latched on to Ford’s clever kick to race in on the right. Ford ended the half with the touchline conversion which made it 10-0 to Tigers. Will Evans replaced O’Connor at half-time but there was no change in the pace of play, with Ford seeing space in behind the defence and kicking to touch within five metres of the tryline on the right. 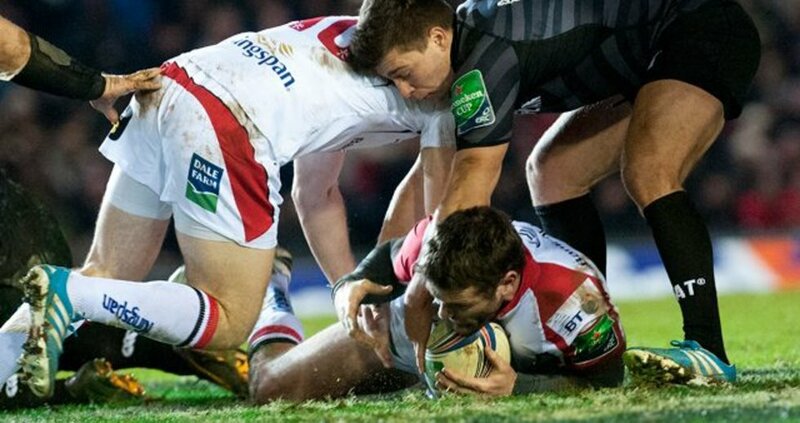 Ulster, though, played out quickly to relieve any pressure in their own territory. Turnover ball in midfield gave Tigers a chance to open play, only for May to be tackled high with the Ulster defence stretched. Ford, sporting a cut above the right eye, took play down the right with the kick and it was the home crowd in fine voice as Kerr prepared to throw in. Billy Burns was penalised for a deliberate knock-on in front of the posts just 10 metres out and Ford plated the ball for the kick, stretching the lead to 13 points with 50 minutes played. A forward pass from Tuilagi inside his own 22 gave Ulster a chance from a scrum and, after winning a penalty award there, they played into the corner on the right. Tigers, though, made a mess of their lineout drive and stole ball, threatening to breakaway as ball was played along the backline before Holmes ran out of space on the right. he had, though, taken play 25 metres up from the tryline as the crowd noise increased behind both teams. Ulster almost found a way through with a cross-kick to the left but Youngs reacted quickly to block Nick Timoney’s progress and then Ford backed him up with a tackle which forced a knock-on just five metres from the tryline by flanker Sean Reidy. Ulster, though, enjoyed their best spell of ball and field position around the 55-minute mark, keeping Tigers penned back near their own tryline as they played through the forwards. Evans was penalised close to the posts and the visitors played into the corner on the left to set up a score for prop Marty Moore. Replacement John Cooney added a tidy conversion from the left to make it 13-7. They added a second from Baloucoune after overloading the eft-hand side just moments later and Cooney’s conversion put them one point in front. 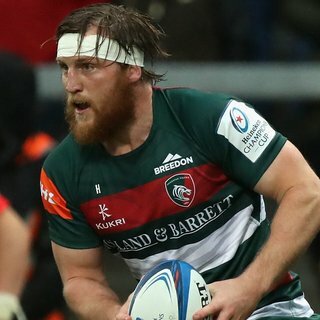 Bateman then read a jinking run from Ford and charged to within 10 metres of the tryline before being cut down as Tigers looked for a response. But Ulster forced an error as Tigers tried to play on the right and kicked clear. Geordan Murphy sent on a new front row for the final quarter-hour and fellow replacement Harry Wells was a prominent ball-carrier through phase after phase of possession in the opposition 22 before referee Ruiz finally blew in the defence’s favour at a breakdown just in front of the posts. A penalty won in defence with 78 minutes gone gave Tigers one final chance as Ford booted play up the right-hand side. But Ross McMillan’s throw was off-target and the away fans started their celebrations in earnest. 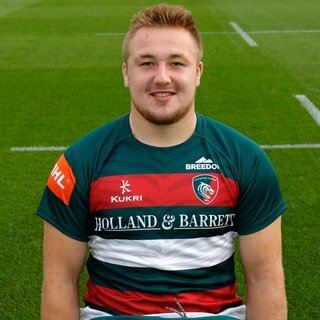 Tigers academy are in action at Welford Road this evening from 6.00pm as they face Yorkshire Carnegie in their Round 5 fixture. Follow the Tigers twitter feed for all the latest from our young cubs as they look to remain undefeated this season. Thanks to all who made the journey to Welford Road and a safe journey home. 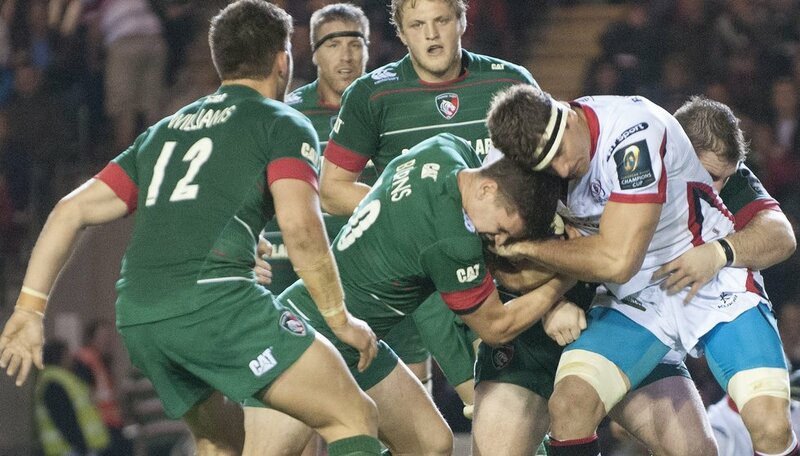 It's full time here at Welford Road and Ulster edge a close encounter 13-14 with a second half comeback. Both sets of fans still making themselves heard in what was a cracking Heineken Champions Cup fixture and marks Tigers final action in Europe this season. Ulster are slowing down the play and work through the phases as Tigers look for the turnover. Final minute of play at Welford Road at tigers chasing the game by a point. Both teams are throwing everything into the last few phases, exchanging possession but winning it back. Jacob Stockdale collects a high ball from George Ford, and Jonny May slips before the tackle as the Tigers midfield come across to lend a hand. Ulster line out right on the half-way line. Tigers change it up with Ben White making his 25th appearance coming on for Ben Youngs at scrum-half. Sam Aspland-Robinson also makes his first senior team debut replacing Jordan Olowofela. A good spell of possession for Leicester Tigers with Ben Youngs and George Ford linking up and keeping the ball moving. Jonah Holmes finds space out wide, but the play switches to the left flank Manu Tries to find a gap. Tigers applying the pressure once again and getting men over in the ruck, but it's eventually lost and Ulster are given the penalty to a huge row from the away fans. Tigers keep the ball moving in the Ulster half from a line-out, but it's kicked up-field by Ulster's fullback. Tigers come back at Ulster and a Ben Youngs box kick sends the ball back into the Ulster half. Tigers press up the pitch, and come back at the Ulster back-line following a return box kick. A George Ford kick finds touch on the right flank and Tigers continue the press. It's a full front row replacement for Tigers as Bateman, Kerr and Cole make way for Ross McMillan, Facundo Gigena and Joe Heyes. Greg Bateman finds himself charging towards the line, but is held up by the Ulster defence. Tigers applying the pressure from the restart as they chase the game. But Tigers lose the ball in the breakdown and Ulster clear into touch. It's another successful kick for John Cooney of Ulster as they take the lead for the first time in the game. Tigers 13-14 Ulster. Ulster find a gap and fly-half Billy Burns chips the ball down the left flank for wing Robert Baloucoune to collect the ball. He runs under the posts with just over 63 minutes played. The Tigers defensive line is holding its own under the Ulster pressure. The Irish team's forwards putting themselves about and the play is forced back but Ulster still with the ball. Both sets of fans making themselves heard from the restart. Tigers with a few handling errors and Ulster back in the Tigers half. It's a successful kick for John Cooney and Ulster right back in this game after some early second half pressure. Tigers till hold a 13-7 lead with just under an hour played. The try is awarded for Ulster after a huge driving maul following a line-out deep in the Tigers half. Marty Moore with the score. Another successful line-out for Ulster and they drive the maul forward and it looks like it's over in the corner. Huge effort from the Tigers pack to clear their lines, but it''s only as far as the 10 metre line. Ulster with the successful line-out and they edge towards Tigers tryline. The ball moves across the pitch to the right flank following some neat phases, but Tigers holding firm. Ulster inching forwards with some driving runs from their back line and they try a kick chase, but the ref spots an offside on Will Evans. Ulster kick right into the Tigers corner. Some great work from the Tigers forwards from the line-out turnover the ball over for Tigers and they sweep the ball out of their backline. Jonah Holmes is caught by a last ditch tackle in his own half and the play moves with line-out. Tigers scrum on their own 5 metre line. Tigers Manu Tuilagi is penalized for a forward pass and we have an Ulster scrum 10 metres from the Tigers tryline. Ulster force the penalty at the scrum and opt to kick for touch. An Ulster line-out and the noise levels turn up a notch again at Welford Road. Ford kicks under the posts to extend Tigers lead to 13 points with just under 50 minutes played. A high tackle on Jonny May gets Welford Road rocking as Tigers apply the pressure early in the second half. Tigers line-out in the Ulster 22 and Williams wins the ball to get Tigers moving. There's a call to the TMO however as scrum-half Ben Youngs gets the ball knocked forward. Some end-to-end play from the restart with a good charge from Greg Bateman but Tigers win a scrum on halfway after and Ulster knock-on. Brendon O'Connor is replaced at half-time by Will Evans. Ulster kick-off the second-half here at Welford Road. George Fords lands a huge kick from the far touchline to add the covnersion and it makes the score 10-0 as the referee blows the whistle for half-time. What a play for Tigers! A few phases and Ford chips it through and it's Matt Toomua who's quickest and he dots it down for the first try of the match. Tigers with another big scrum and win a free kick, Ben Youngs goes quickly and it's Tigers on the attack and up into the Ulster 22. Tigers win the ball at the lineout and look to put Manu through a gap but there's a loose ball and it's a knock-on for an Ulster scrum just outside their 22. Tigers with a huge scrum and we win the penalty, Ford steps up and kicks for touch getting the lineout on Ulsters 22. Ulster have the lineout on our 10 metre line but there's a fumble in the following phases and Tigers win a scrum. It's a huge turnover from Jake Kerr and Tigers as it's all Ulster from the scrum. Ulster build phases and work into Tigers 22 but the ball is out at a ruck and Kerr dives on it for the turnover and Tigers kick for touch and the lineout. Both teams with testing high kicks from the restart but Ford is a little too strong and it rolls past the tryline and dead for a Ulster scrum on our 10 metre line. George Ford lands the penalty for the first points of today's game to make it 3-0 after 31 mintues. The ball goes from end-to-end as Ulster kick ahead but Holmes returns the kick with a great chase with Olowofela and the next phases Tigers win a turnover penalty. George Ford points to the posts. Ulster with the ball from the lineout but uickly kick it back and Olowofela is on the run again. Tigers show some good skills to get back up to the Ulster 22 but there's some messy passe and the referee calls knock-on for a Ulster scrum just outside their 22. Tigers go with quick hands from the scrum and Olowofela makes good yards with the ball but is pushed into touch. Another brilliant steal in the lineout, this time from Sione Kalamafoni and Tigers kick the ball ahead. Ulster run the ball back and Mike Williams make a huge tackle on full-back Louis Ludik and he knocks the ball on in the process for a Tigers scrum inside the Ulster half. Ulster with the ball now as they look to work into Tigers half and the defence looks strong but Tigers are penalised for a high tackle and Ulster kick for the lineout on Tigers 22. Ulster find space on the far side as they run the ball out their 22 from the scrum and chip across field but Jonah Holmes collects the ball and clears the ball to touch for a lineout on the half-way. Tigers with the ball and the phases as they work into the Ulster 22 with a storming run by Dan Cole but the ball goes loose and the referee calls a knock-on and Ulster scrum just inside their 22. Both teams seem set to kick this game and there's a few more from both sides before Ulster find touch in their 22 for a Tigers lineout. Tigers with the ball from the scrum kick ahead and it's Ulster trying to build phases from their 22. Some more kicks from both sides before Ulster are again working their way out their half. It's a messy lineout but Tigers have the ball and both teams go for high kicks as they test out the back field players, it's Tigers ball though as Ulster are called for a knock-on inside the Tigers half. Ulster create a driving maul from the lineout and kick clear where they find touch on their 10 metre line for a Tigers lineout. Ulster are penalised at the lineout for not throwing straight so Tigers have the scrum and it's all Ben Youngs as he finds no one ahead of him on the blindside so makes a break and is only stopped as he's pushed into touch on the Ulster 5 metre line. Tigers with quick ball from the scrum and there's some great handling from our back line to get into the Ulster 22 and nearly over the tryline but as the ball comes back wide there's a fumble and Ulster win a penalty at the breakdown. Ulster kick for the lineout on their 10 metre line. Tigers win the ball at the lineout and chip ahead for a contest in the air between Jordan Olowofela and Robert Baloucoune but he knocks-on for a Tigers scrum just outside the Ulster 22. Ulster look strong off the scrum as Marcell Coetzee goes down the blindside but George Ford holds strong and he is bundled into touch in front of the dugouts for a Tigers lineout. Ulster on the attack from the lineout but Dan Cole puts a huge tackle on Billy Burns to win a turnover and Jonny May is released on the far wing. May chips ahead into space but Ulster are quickest to the ball and it's Ulster on the charge from their own tryline. Ulster knock-on in the mid-field and Tigers look to capitalise but are penalised at the breakdown and Ulster have a scrum just inside their half. Tigers chip ahead but Ulster recover and now look to get abck into Tigers half but Jake Kerr goes for an intercept on half-way but unfortunately knock-ons for penalty, Ulster kick for the lineout in Tigers half. Graham Kitchener disrupts the Ulster lineout and wins the ball for Tigers who are on the ccharge and run up to halfway. Ulster win a penalty at the lineout as Tigers are penalised for side entry and kick for a lineout just outside the Tigers 22. 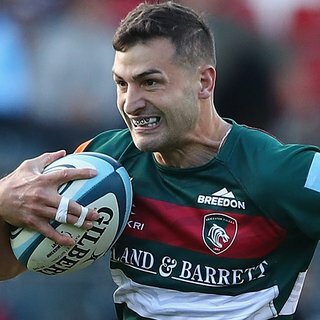 There's some back and forth with possession and some kicks from both sides before Tigers win a turnover and runs it wide and back into the Ulster half before Jonny May is tackled into touch. It's obviously wet conditions out there as Ulster get the ball out wide and look to build some phases but the first receiver knocks on for a Tigers scrum on the opposite side of the pitch. Ulster collect the kick-off and kick clear to touch for a Tigers lineout on Ulster's 10 metre line but there is a fumble at the lineout and Ulster get a scrum. 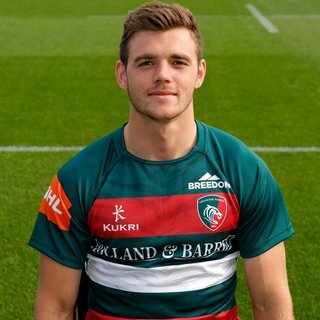 George Ford kicks things off here at Welford Road as we kick towards the Robin Hood Stand. Rory Best leads out the Ulster team ahead of George Ford and the Tigers and we are ready for kick-off! The teams have finished their warm-ups are head back into the changing rooms as we are just 5 minutes away from kick-off. We're just half an hour from KICK OFF in today's Heineken Champions Cup clash between Tigers and Ulster at Welford Road. 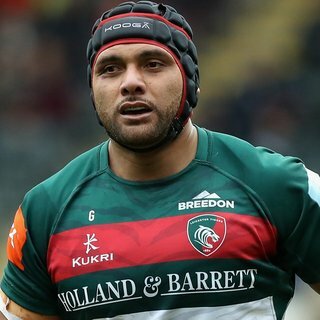 Neither side has made changes to the matchday squads announced on Friday, with Tigers welcoming back the quintet of international stars including Manu Tuilagi, George Ford, Dan Cole, Sione Kalamafoni and Jonny May. Well, we're back home for the final European fixture of the 2018/19 campaign up against Ulster and less than an hour away from kick off in this Pool 4 clash with our Irish counterparts. 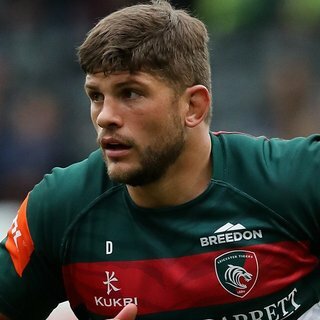 Ben Youngs will move into the top three appearance-makers in Leicester Tigers’ European Cup history after being named in the team to face Ulster Rugby at Welford Road on Saturday. The Champions Cup Pool 4 fixture will be followed at 6.00pm by the Premiership Rugby Under-18 Academy League game between Leicester Tigers and Yorkshire Carnegie. 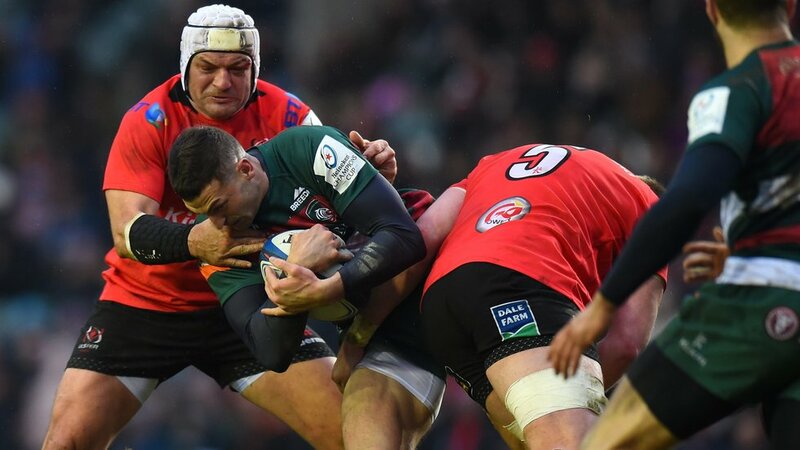 Leicester Tigers and Ulster Rugby meet for the 10th time in European competition on Saturday in the last round of this season’s Heineken Champions Cup pool stages. Racing 92 – who are at home to the Scarlets in Paris – top Pool 4 with 21 points while Ulster are on 18 and chasing the points which would guarantee their own qualification. They have not reached the knockout stages since 2013/14 – when they won at Welford Road in Round 6! Tigers have not won in the last game of the pool stages since a 9-5 victory over Toulouse in the snow at Welford Road in 2013. Head coach Geordan Murphy said: “Home performances in December and January have been pretty good with the wins against Harlequins and Gloucester in the league and there have been a lot of positive pictures we can focus on. “We made a lot of changes last week and it was important we got guys some gametime, but we’ve got a few back this week. Murphy recalls Dan Cole, George Ford, Manu Tuilagi and Jonny May after the England international quartet sat out the defeat against the Scarlets. 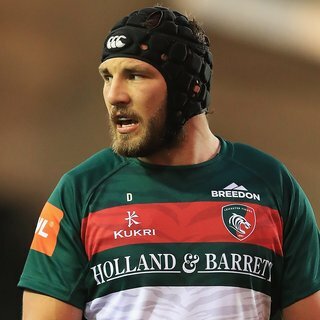 Jonah Holmes and Jake Kerr are also included after being named in their respective international squads this week and Sam Aspland-Robinson could make his first appearance at Welford Road. Ben Youngs makes his 68th appearance in the tournament to move into joint-third place in the club's all-time list behind Murphy and Martin Corry. Ulster make just one change from the team that beat Racing, with international lock Iain Henderson returning from injury to make his 100th appearance for the province. Jacob Stockdale, the only player to score in every round this season, is on the wing. French official Alexandre Ruiz is match referee and takes charge for the first time at Welford Road. Kick-off is at 3.15pm and there is live coverage scheduled on BT Sport. If you are not attending Saturday’s game, you can keep up to date with all of the action using the Tigers Matchday Live service on the club website, mobile website and official app. Or follow the club’s social media pages on Facebook, Twitter and Instagram. 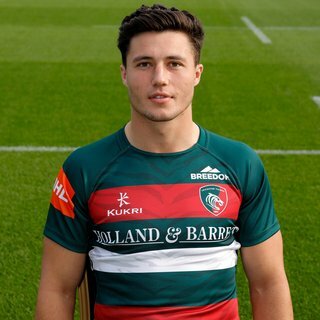 In a double bill of rugby at Welford Road, Tigers Under-18s host Yorkshire Carnegie in the Academy League at 6.00pm. Click here for the full matchday guide.